Scotland is a nation in northwest Europe and one of the four constituent countries of the United Kingdom. It occupies the northern third of the island of Great Britain and shares a land border to the south with England. It is bounded by the North Sea to the east, the Atlantic Ocean to the north and west, and the North Channel and Irish Sea to the southwest. Apart from the mainland, Scotland consists of over 790 islands. Edinburgh, the country's capital and second largest city, is one of Europe's largest financial centres. Scotland's largest city is Glasgow, which is the centre of the Greater Glasgow conurbation. Greater Glasgow is home to approximately 40% of Scotland's population. Scottish waters consist of a large sector of the North Atlantic and the North Sea, containing the largest oil reserves in the European Union. What makes Scotland unique? Probably you may get a variety of answers, but the most common answer is likely 'Whisky'! Whisky is acknowledged as the national drink of Scotland. GNER(http://www.gner.co.uk) is one of the best and fastest train service between London King's Cross, the East Midlands, Yorkshire, the North East of England and Scotland which is owned by Sea Containers Ltd. The facilities were really good including wireless internet except the toilets! We boarded the train at 10:00PM from London Kings Cross station. The Auto Europe car agency is just in front of the Edinburgh station where we had booked the car. We finished the formalities within 10 minutes and started exploring Scotland. Our first destination was Stirling Castle. 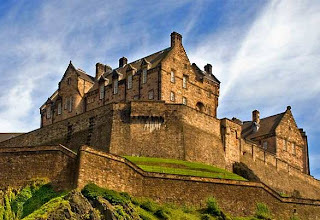 Stirling Castle is an essential part of any visit to Central Scotland. This castle had been attacked at least 16 times. A number of Scottish Kings and Queens had been baptised or crowned or died within or near Stirling Castle. At least one King was murdered nearby while another within its walls. Sits atop the Castle Hill, Stirling became the strategic military key to the kingdom during the 13th and 14th century Wars of Independence and was the favorite royal residence of many of the Stuart Monarchs. There are excellent historical displays, a recreation of the 16th century kitchens with interactive exhibits and the Regimental Museum of the Argyll and Sutherland Highlanders which details their eventful history from 1794 to the present. On the east side of the upper court is the Great Hall built by James IV, recently restored to its original appearance after many decades' use as a barracks. The image of the castle appears on the reverse of a Clydesdale Bank £20 note.